Concrete is a hard and resilient material. It can withstand all kinds of weather conditions, is easy to maintain, and will last for a long time. This resilience makes it a great building material, which is why it’s used in most modern construction projects. Unfortunately, its strength can also be its weakness. Concrete can’t stretch and bend because it’s not flexible like wood. When the concrete expands and contracts because of the weather conditions, its surface inevitably cracks under the pressure and can become weak. The only way to avoid this is to add joints to the concrete. Concrete joints are placed in the concrete to compensate for the expansion and contraction of the material due to weather conditions. In order to avoid cracks, concrete installers will predict where the concrete will crack and how it will expand. Based on their assessment, they will create forming, saw, tool, and place joint formers at different locations. These pre-formed cracks will help improve the overall performance of the concrete surface and ensure it has room to expand and contract without causing any harm to the surrounding structures. Sometimes, contractors need to install these joints in order to stabilize the wall or floor. Without these joints, the surface would be too unstable and therefore prone to damage. These joints will allow the concrete to move freely and settle into the subgrade overtime. The concrete slab will be independent of the structures surrounding it, so any expansion and contraction won’t have an impact on them. Isolation Joints – As the name suggests, this joint exists to isolate the concrete slab from the surrounding constructions. When the concrete slab expands or contracts, the isolation joints will ensure the slab doesn’t crack or cause any problems to nearby pipes, pillars, walls, and columns. These joints are almost always placed in outdoor installations because the concrete surface doesn’t expand as much in indoor, climate-controlled environments. Construction Joints – These joints are placed to keep new concrete in place. They’re essentially screed rails made from wood, metal, or plastic and are placed during the pouring and finishing of concrete. The construction joints will allow you to pour the concrete in steps and control the slab placement according to your requirements. You can also use construction joints as contraction joints if you plan the placement well. Contraction Joints –This is one of the most troublesome but commonly used joints. Both isolation and construction joints are placed before the concrete is poured in and therefore they’re in place as the slab dries and settles into the subgrade. Contraction joints aren’t placed before the concrete is poured. They are added to the surface as the concrete settles and before it has a chance to form cracks. The contractors will create cracks in the direction they desire to control it and preserve the structural integrity of the concrete. Decorative Concrete Joints –Constructing joints in decorative concrete requires a little more planning and careful execution. The decorative stamping on the concrete doesn’t sink in deep enough to provide the stability the slab will need. The joint should penetrate at least 1/4th of the surface to ensure the cracks are carefully controlled. You just need to cut along the pattern of the stamped design to ensure the joints aren’t visible from the surface. This is one of the most important aspects of concrete constructions. You need to plan the placement and sealing of the joints well to ensure your concrete slab remains intact and structurally sound for a long time. Placing the Joints – The joints should be evenly spread apart and should penetrate at least 1/4th of the surface to be effective. Make sure you cut the joints as quickly as you can because uncontrolled cracks can easily form in 6 to 12 hours of finishing the concrete. 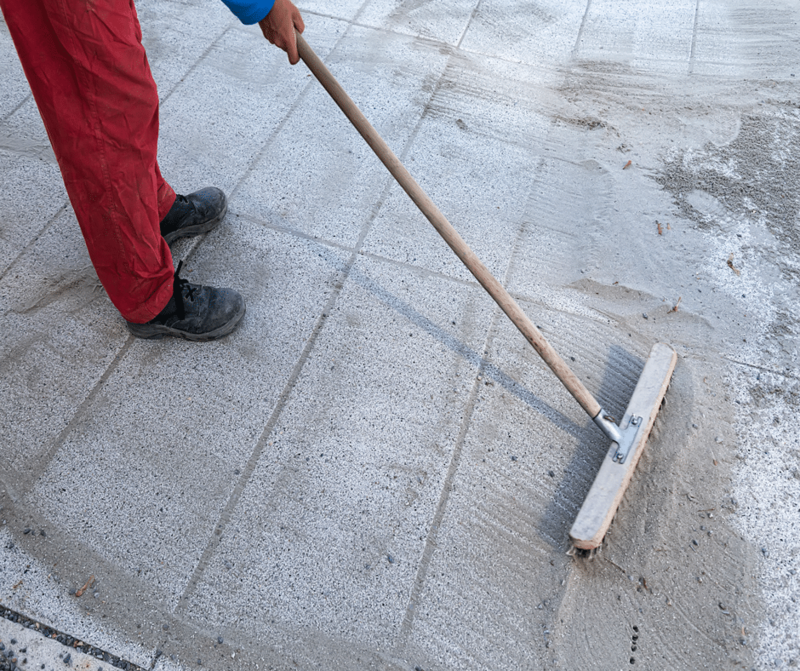 Sealing the Concrete – Sealers protect the joints from moisture, dust, and debris. They are soft enough to accommodate the expansion and contraction of the concrete so you don’t have to worry about sealers adding pressure to the joint. Sealers will also improve the overall aesthetic appeal of the concrete and disguise the joints wherever possible. Without joints, your concrete slab will crack under pressure and form uncontrolled fissures. These cracks can compromise the structural integrity of the concrete and impact its appearance. Well-planned joint placement is the best way to keep your concrete slab intact and strong.